The other day I was listening to a local Christian radio station and I heard a commercial for a “gift this Christmas”. I’m not going to tell you what it was, but the people gave all these reasons why someone should buy this item and give it to someone. Then, at the end of the commercial they said “honor The Lord by giving this gift”. Really? Honor The Lord by buying some Christian merchandise? Shouldn’t we better honor The Lord by living our lives in service to Him and being content with what we have? Do we really need more stuff? I see this all the time. 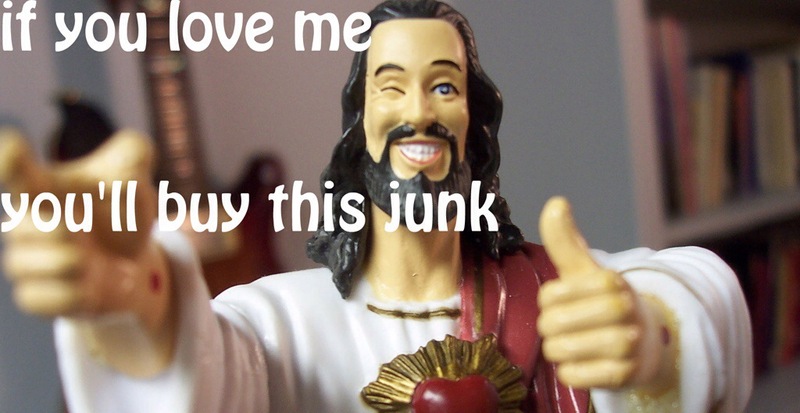 “Christian” companies using their religious preference to get you to buy their goods. Is there such thing as a Christian company anyway? Sure, there are Christians who own companies. There are companies who deal with merchandise that promote Christian symbols and ideas. There are Christians who work for companies, but the companies themselves cannot be Christian or non-Christian. I hear commercials by companies who have no direct tie in their business to anything specifically Christian. They aren’t selling Christian goods or teaching Christian ideals, and yet they are advertising themselves as a Christian company. 1 Timothy 6:5 gives warning that there are some who think that their godliness is a means to financial gain. He warns to watch out for these people. He says rather to find godliness with contentment. As you live your life, don’t use your status as a Christian to manipulate or coerce people. You should gain people’s trust and friendship by the way you live. Christianity is not a badge we wear but a life we live. And if the fruit of our lives don’t match up with the faith we profess then that makes us a hypocrite, and Jesus had a lot of negative things to say about hypocrites. We are called to be consistent in how we live. When we make a commitment to something, we follow through because we have made our “yes” as good as a promise. When we talk to people they are able to hear Jesus reflected in our speech. When we do things, whether working or playing, people are able to see that we are doing everything to the glory of God. When we run a company or work for a company we should be the most highly sought after people because of our reflection of the attitude and lifestyle of Jesus in our lives. May you be people who reflect Jesus in everything you do. And may you be content with what you have (Hebrews 13:5-6). God bless you!